Piglets enjoy some play time at the U of S Prairie Swine Centre. Photo by Christina Weese. It’s playtime for piglets at the Prairie Swine Centre (PSC), where Western College of Veterinary Medicine (WCVM) researcher Dr. Yolande Seddon hopes to find out whether piglets that play are better able to cope with life’s stresses. 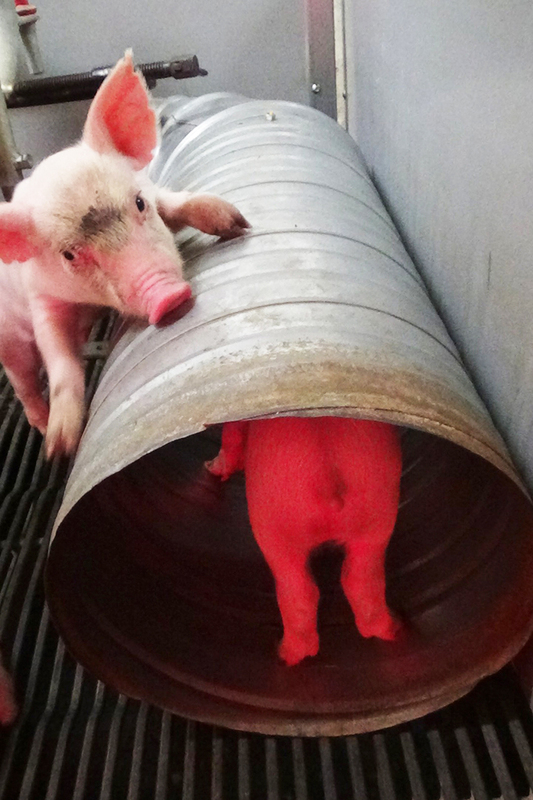 Researchers included a tunnel in some of the piglets' pens to see how much they played compared to other piglets that didn't have access to the prop. Photo by Nicola Schaefer. Animals play only in the absence of stress, pain and fear, says Seddon, an assistant professor in swine behaviour and welfare at the WCVM. Additionally, play has a critical role in the behavioural development, influencing learning, development of socials skills and motor skills. It is also hypothesised that play could be a source of pleasure, reinforcing performance of this behaviour. “If we can find out that [play] benefits the behavioural development, physiology and the mental state of the pigs, then there is a strong basis to try and offer opportunities for play in modern production systems to promote good pig welfare,” says Seddon, who also holds the Natural Sciences and Engineering Research Council of Canada’s Industrial Research Chair in swine welfare. Seddon believes that enriching piglets’ environment will do far more for them than relieve boredom. It may set them up with beneficial skills and help them through the most stressful period of their lives. At weaning for example, piglets are separated from their mother, changed from a liquid to a solid diet, moved to a new location, and then required to live with piglets that are from other litters. All of this change can lead to health issues for pigs such as digestive problems and/or a drop in body weight. Seddon hopes her play research may help piglets better adjust, reducing stress for piglets and the medications used to support them. If Seddon’s team finds evidence that playing improves pig welfare, using methods that producers could easily adopt could lead to real opportunities for enhancing pig welfare in existing production systems. Science has already shown that more space and interesting environments are good for pigs, but to help improve health and hygiene, pigs are still largely raised in barren environments. Seddon explains the challenge of simply providing extra space in an industry with fluctuating hog prices. “Space is very expensive. If you’re going to provide more space within an existing barn footprint, you’re going to put less pigs through, and can you make the finances work?” she asks. That’s why the preliminary play studies by Seddon are identifying how important extra space is to promote play, or whether can play be promoted through modifying use of existing pen space. Additionally, Seddon is investigating how providing opportunities for play periodically could enhance any beneficial effects. “It’s the fact that [the pigs] are getting it periodically that makes it a more exciting event … and that is something that can likely work in a production unit,” she says. 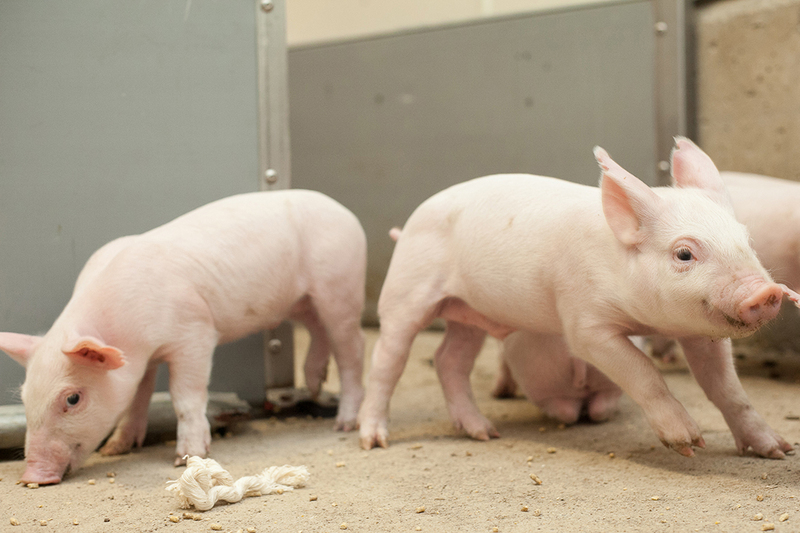 Funded by an undergraduate student research award from the University of Saskatchewan, a research team worked last summer to answer the initial question: what simple adjustments are needed for piglets to play more in a standard production environment? The team made simple modifications to the environment of a group of piglets at the Prairie Swine Centre, giving them periodic access to a few square feet of extra space or to a tunnel inside their pen for 30 minutes a day (modifying the use of existing pen space). Then they compared how much these piglets played to piglets raised without these treatments. Seddon suspects the piglets will use the tunnel to hide and chase each other through, which may improve their social development — an idea she developed having observed piglets using a pop-hole in a farrowing pen to play through. When pigs have experience with extra space or a tunnel, they have had greater exposure to new life experiences, and this can drastically alter their development. If the research can show that play will benefit the welfare of pigs and their productivity, Seddon says this will have big implications for the barns of the future, which may have opportunities for play built right in. “We need to develop production systems that meet economic, environmental and animal welfare sustainably … I personally think the impact play could have is huge,” she says. Nicola Schaefer is a second-year veterinary student at the Western College of Veterinary Medicine. She is originally from Winnipeg, Man. Her story is part of a series of articles written by WCVM summer research students. Article re-posted on 2-Apr-2019 4:59:28 PM .